The Solo Blog Index dropped below its par value of 100 for the first time in four weeks. BitterGraceNotes slid 42% after nearly three months of steady rankings; JaimeLeParfum accelerated a four-week downturn by dropping 25%. 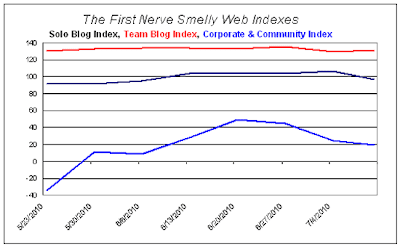 The gas continued to leak out of the balloon as the motherships on the Corporate & Community Site Index lost six points, with Sniffapalooza losing big altitude. 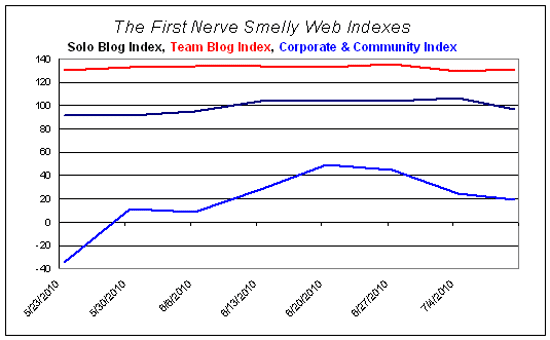 Over at the Team Blog Index it was steady as she goes; the team bloggers continue to turn in very even Alexa rankings. Interesting post! I just happened on your blog (the musk project brought me here), and I have enjoyed rambling through the archives. What is your theory regarding the rise or fall of perfume blogs? I'd be interested in your opinion. I believe it was you that addressed the group at the 2008 Sniffapalooza Fall Ball, which I attended. Your olfactory findings are very interesting, indeed. Welcome to the FirstNerve. Hope you enjoy your ramble through the archives. I'd just started blogging when I gave the Sniffapalooza talk you heard. I see you you've launched your own fragrance blog. My Smelly Web Index data reveal a few consistently high-flying sites and a mad scramble among those of us with less lofty Alexa rankings. Solo sites sometimes burn out (long-haul blogging takes stamina) and newly born ones take their place. It takes a while to reach take-off speed, so keep your hand on the throttle. Bon voyage!